Humans need to drink quality water and eat quality salt first, then diet and exercise. People who avoid salt completely begin to rapidly age by the age of 30; they may start losing hair, develop hypothyroidism, and show signs of constipation, and much more. Even with that, they consume high amounts of refined salt, which is is bleached and treated with chemicals, from canned and processed foods. The content of sodium chloride in refined salt is 97-99%; it often contains calcium aluminosilicate, potassium aluminum silicate, and aluminum silicate. Daily food and beverage choices impact our body's pH levels and mineral content. It takes 20 alkaline parts to neutralize one acidic part. The tasty and body-friendly unrefined salts from Baja Gold and Creatrix Solutions brands are food salts that alkalize the body. They are carefully crafted and minimally processed in order to retain the highest possible amounts of naturally occurring essential minerals and trace elements. Daily consumption of these alkalizing food salts helps nourish the body and contributes to healthier and more vigorous living! Unrefined salts, such as Baja Gold Sea Salt, come from the ocean, but they are mined from underground salt deposits and contain numerous trace minerals. They provide sufficient nutrients for the body that help the immune system stay strong enough to resist illnesses and fight infections. Baja Gold Sea Salt has a very low sodium chloride (NaCl) content of 79.12% that lets you consume more of the many trace minerals it contains since they are more bioavailable. Baja Gold Sea Salt also has an above neutral alkaline pH of 8.04. 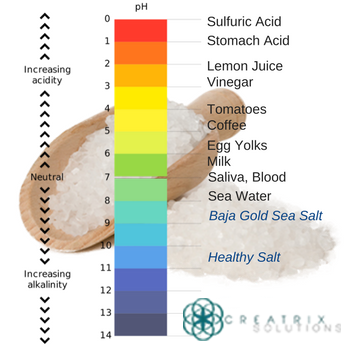 Healthy Salt from Creatrix Solutions is the best food salt for alkalizing the body, boosting energy levels, and balancing body nutrients. It has undergone thorough testing and contains the lowest sodium chloride and moisture levels, the most trace minerals, the highest pH, and the smallest particle size, compared to any other food salt in the world. Alkalizing Healthy Salt has an incredibly alkaline pH of 10.72, and is purely alkaline and extremely therapeutic. It contains only 76.27% sodium chloride (23.03% sodium and 53.24% chloride), 0.35% moisture, 3.49% fat, and up to 70 trace minerals. Use it for seasoning homemade dishes and prepared foods, as well as for oral hygiene and boosting alkalinity and mineral levels of the body. Many authors recommend drinking Sole water made of Himalayan salt for better health and improved energy levels. Himalayan pink salt is very popular nowadays, with 74,000 searches on Google per month. It has been mined and sold for consumption for centuries, which make it one of the world's best-selling food salts. But in reality, there are better salt choices out there based on comparisons of pH levels, ORP values, trace elements content, and sodium chloride levels. Food salts with higher pH and lower ORP values, such as Baja Gold Sea Salt and Healthy Salt, are considered to alkalize the body and have more healthy antioxidant properties. Alkaline food salts normalize the body's pH levels by inching it back toward a neutral mark, which really means a lot after eating acidic foods, such as tomatoes or grains, or drinking acidic beverages, including soda and coffee. Alkaline food salts are also high in trace elements and minerals (53 minerals in Baja Gold Sea Salt and up to 70 minerals in Healthy Salt), which makes both of them far better and healthier than Himalayan Pink Salt. Shop these mineral-rich, nutritious, alkalizing, and 100% natural food salts below!